We've got solutions. Stock seals ship in 24 hours or less! BudcoSecuritySeals.com’s high-security bolt seals offer the highest level of protection for shipping containers, trucks and trailers. We stock the popular SnapTracker Bolt Seals as well as the Intermodal II Bolt Seals. Budco bolt seals meet CTPAT compliance and ISO 17712 Certified High-Security Bolt Seals regulations. To see our full line of in-stock high-security bolt seals click here. BudcoSecurity.com’s bolt seals offer a cost-effective, reliable security barrier for high value cargo, cross border shipments trailers and container latches. As opposed to indicative seals that made of plastic and can be easily removed, bolt seals are constructed of a steel bolt and a plastic-coated steel chamber. They can simply be pushed together by hand to seal but require bolt seal cutters for removal, therefore providing excellent security for sensitive spaces. As a fraud protection measure, all of our C-TPAT ISO 17712 compliant bolt seals are numbered on both seal body and head to prevent substitution of either part. Also, rub-proof laser marking is used to ensure the bolt seal’s integrity in transit. Click to view our full product line of Bolt Seals and Security Seals. At Budco, our dedication to total customer satisfaction starts with stocking an unsurpassed selection of security seals. That way, you get the right products to keep your business safe, efficient and compliant--fast. When quality counts, count on the trusted leader for all your security seal needs. Budco--security that's evident for more than 50 years. 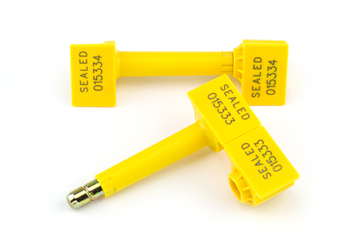 See Budco Security Seals for Security Seals, Bolt Seals, Cable Seals, High Security Seals, Padlock Seals, Plastic Trailer Seals, Plastic Truck Seals and more!